There has been a long tradition of creators releasing their work on their own, without the backing of a studio or a publisher. The coming of the Internet has meant that this space has expanded colossally. The American Scott McCloud was one of the first to explore this new medium. McCloud pioneered what he called the “infinite canvas" by working directly with the basic building block—the panel. He said “there’s no reason that long-form comics have to be split into pages when moving online. Pages are an option—and they can work well when screen shapes are taken into account—but the advantages of putting all panels together on a single ‘canvas’ are significant and worth exploiting". With touch screens eliminating the need for scrolling, it’s clear that this is an idea whose time has come. My favourite experiment is called “The Morning Improv"—McCloud spent an hour every morning doing a full-length piece based on a word cue suggested by a reader. With pieces like Brad’s Somber Mood, which throws together existential despair, suburban nihilism and references to Vladimir Nabokov and Ingmar Bergman, all in the course of just 11 panels, McCloud began his experiments in the mid-1990s, hitting his stride with Web comics at the turn of the millennium. Now, more than a decade later, these comics still work very effectively. The early 2000s also saw David Rees’ Get Your War On (GYWO) series, which went on to acquire a cult following. GYWO was a comic-strip assault on the war on terror with absurdly simple weapons. Rees scanned a 1980s’ business illustration book that had clip art containing a “variety of business and office-related subjects and situations: secretaries taking dictation; clerks filing; people seated at desks, on the phone, in conference, typing, greeting visitors, and more. Also shown is typical office paraphernalia: pads and pens, clipboards, typewriters, desktop computers, floppy disks, office mugs". It may seem highly unpromising as raw material, but Rees, using just 12 clip-art pieces, went on to run the series for eight years, with new updates every week. Rees’ foul-mouthed office workers, trapped in endless conversation loops, are oddly prophetic. In a strip from 2004, for example, two characters, Accounts Receivable and Accounts Payable, argue, “In a civil war who gets naming rights? Will the Kurds and Sunnis have different names for it? I’m probably gonna root for the Kurds so I guess I’ll go with their name." Similarly, the brevity of the medium allows short but intense stories to be played out. Sam Alden’s Haunter, for example, tells a wordless story rendered in lavish watercolours. Alden conjures up a landscape suffused with menace, as beautiful as it is deadly. The oddly elongated pacing harks back to what McCloud had seen as the potential of comics not bound by paper and page—stories without limits. 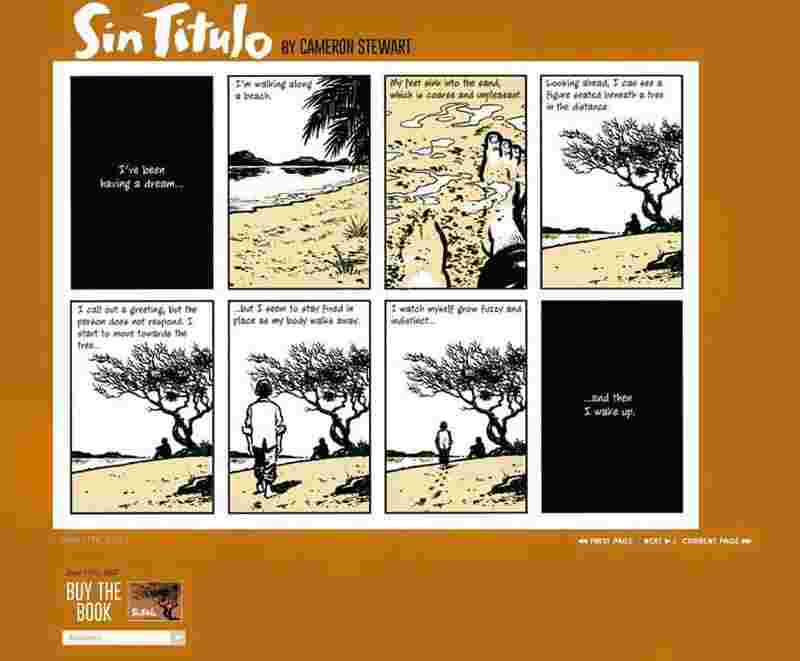 “Print cartoonists make a constant series of compromises in pacing and design to stuff our stories into pages. We add and subtract panels, restrict size variation, break reading flow and rarely, if ever, vary the distance between panels for fear of wasting paper. Without such restrictions, though, every one of those choices can be made exclusively on behalf of the needs of the story," says McScott on his website.